The Rho Ophiuchi dark cloud is a star-forming region at a distance of about 400 light years from Earth. The inset shows spectra of the rare molecule H2D+, detected with the APEX telescope in Chile, overlaid onto an infrared image of this region. 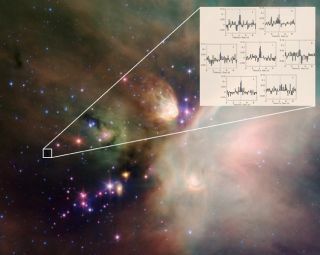 Astronomers have mapped a rare typeof molecule in cosmicclouds that could reveal secrets about how stars form. Stars form in clouds of dust and gas.Before the birth ofthe star, these clouds are dense and extremely cold, causing most ofthegaseous molecules to freeze on the surface of solid dust grains,similarly tothe condensation of water vapor onto a cold mirror. This condensation process happens toalmost all of the gasmolecules, leaving only a few still in gaseous form. These conditionsleave roomfor the development of a peculiar chemistry between the remaininggaseous molecules,leading to the formation of the rare molecular species H2D+ andD2H+, built from thehydrogen atom (H) and its heaviervariety deuterium (D). These peculiarmolecules have been the target of many observational searchesin the lastdecade, but because they are formed in such small quantities, they arehard toobserve. These scarcemolecules have long been an observational goal of astronomers. "This is because their emission canhelp astronomers tounderstand the extreme physical conditions in stellar cocoons," saidB?reng?re Parise of Germany's Max-Planck-Institut f?r Radioastronomie,who ishead of the Emmy Noether research group. "Their study is essential forunderstanding the processes that lead to the formationof stars and their planetary systems." The observation of these peculiarmolecules is also madedifficult because they emit light with a very short wavelength. Thewavelengthof the emission, shorter than one millimeter and therefore referred toas"submillimeter light," lies in a frequency window where the earthatmosphere is transparent only under the best weather conditions. These observations thus require thebest submillimetertelescopes located at the best observing sites, joined with sensitiveinstruments that can detect these faint signals. That helps explain why mostobservational searches for thesemolecules ? especially the particularly hard to find D2H+? have been unsuccessful. To date, there has been only one claimeddetectionwith another submillimeter telescope, with an uncertain frequencycalibration. The new observation resulted in asurprising discovery: Themolecule was not only detected in the coldest center of the core, asexpectedby the research team, but also in some of the side pixels, showing thatthedistribution of this molecule is extended, and not only confined to theinnermost region of the core. This finding is an important piece ofinformation forunderstanding the peculiar chemistry taking place in the extremeenvironmentsfrom which stars form. It implies that the freezing of molecules ondust grainsis extremely efficient, a result that the team will try to confirm byindependent observations in the coming months. "This is the definitive confirmationof the existence ofthis rare molecule in space," Parise said in a statement. "Theinformation on its spatial distribution provided by the CHAMP+observationopens the possibility to investigate in details the chemical andphysicalprocesses taking place during the early phases of star formation."